At several people’s recommendation, I ordered some samples of Rockin’ Green detergent. The lavender mint scent smells fantastic! So far, it seems to be working well. It also looks like we didn’t rinse enough after washing before – we were doing one extra rinse but it sounds like we needed to do another. The diapers just went in again for another run through. I took them out of the washer this morning to dry them, only to discover gel beads from a disposable diaper in them. I really hate it when a disposable diaper goes through the wash. The boys helped me rinse the diapers out in the tub, then I wrung them out and put them back in the washer with a tiny bit more Rockin’ Green. Then I did two more rinse cycles after that. What a lot of work for this load – I believe once I’m done they will have been through 5 or 6 times at least. :rolleyes_tb: They should be good and clean by now though! After using cloth diapers faithfully for almost six years, we have switched to disposables. It is a bit frustrating. With Samuel, we used cheap prefolds and plastic covers. I later made him some fleece covers, and used that system until he was out of diapers. With Caleb, I made some Rita’s Rump Pocket diapers and loved that the system was easier than folding and pinning prefolds. Then he started getting rashes that wouldn’t go away. At first, I thought it was related to the materials the diapers were stuffed with. We experimented and changed and nothing really made much of a difference. We tried to keep him changed as frequently as possible but it never really got a lot better. Anna came along. I made her a couple dozen of her own Rita’s Rump Pocket diapers. We had fewer issues with Anna and rashes so we just concluded that there was nothing wrong with the diapers themselves, and that Caleb must just have a lot of acid in his system. We saw the doctor when Caleb’s rashes turned into blisters. He referred us to a urologist, who also couldn’t help us. I started reading about cloth diapers again, trying to figure out what the problem was. It was our detergent. 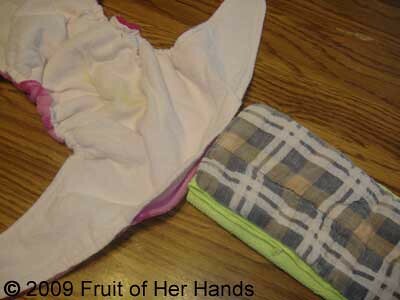 I used homemade with Samuel’s diapers with no problems. But clothes got dingy pretty quickly, so I switched to using storebought for all our laundry. When we added Caleb’s diapers I thought the Free and Clear detergents we were using would be good. In trying to find the cause of Caleb’s rashes though, I found out that the Free and Clear we used the most was one of the worst detergents for cloth diapers because of the buildup it caused. We switched to Sun powdered detergent after I read this article on the Green Mountain website. Caleb’s rashes cleared up almost instantly. I was thrilled. Almost as quickly, I started noticing that Anna was beginning to get rashes. To make a long post a tiny bit shorter, it turns out that Anna is sensitive to the Sun detergent. So I made up a batch of homemade detergent again, since it worked so well with Samuel’s diapers. We put the diapers on Anna and started watching her. Within a day, she had a rash again. Evidently she is sensitive to the homemade detergent too. *sigh* We have rinsed and rinsed the diapers, and straight out of the wash, they smell clean. But the way Anna’s skin is reacting, it’s as if there is a lot of buildup in the diapers. I don’t mind experimenting and searching to find a good detergent, but not at the expense of my little ones. We put the kids in disposables. It absolutely kills me to put a disposable product on them knowing we’re buying it to just throw away. Especially when we have something resuable (that I don’t mind dealing with!) here already. But these rashes have GOT to stop. I’m going to try to strip the diapers again. We tried it several times but maybe more rinses or something will work this time. The whole point of this insanely long post is this: Does anyone know of a good cloth diaper detergent that’s not too expensive? I don’t want to spend a ton on the detergent – we might as well use disposable diapers if the soap costs a lot. But there’s got to be SOMETHING out there. Anyone? Help? Please? Recently I came across a pattern for fleece soakers. They go together really easily and doesn’t require a lot of fabric. They’re really trim, and do a great job of containing the wetness. Even though I measured both kids (the green soaker is for Caleb), they both fit pretty snug. Next time I sew any, I’ll make the next size up. And just in case anyone is wondering, I still love the Rita’s Rump Pocket dipes. Since Caleb’s have seen nearly constant use for the past two years though, they’re getting really thin and threadbare in some places. I’m hoping he’ll be out of diapers before too much longer, but until then. . . 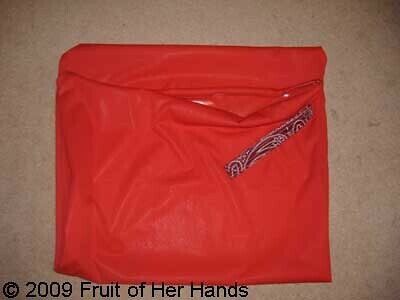 The pattern also includes instructions for adding an outer skirt to the soaker (similar to these). I’m really tempted to try those for this summer! I have not tried cloth diapers before, but I am wanting to. With the RRP pattern, do you also need to make the cover to go over the diaper? Also, could you explain in more detail about “stuffing” the diaper? I’ve read all your blog posts on cloth diapering – thanks for all the tips. I answered her in an email, but then I thought that others might be interested in the information as well. 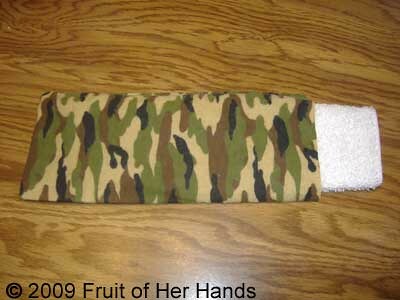 Depending on how you make the Rita’s Rump Pocket diapers, you will need a cover. Mine have fleece on the outside, so they’re not waterPROOF but they are water resistant. They’ll leak if they get too saturated. You could make them with just cotton flannel, and they’d work wonderfully, but you would need a cover. We use microfiber cloths from Walmart to stuff them. We fold one side down about a third of the way, and then fold it in thirds in the other direction. Then we place a thicker soaker on top of it. 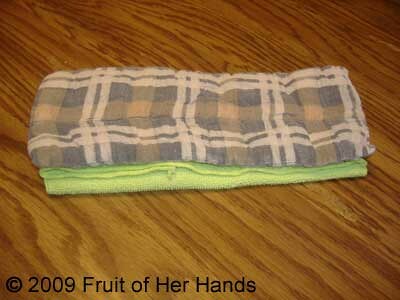 The soaker is a washcloth, also folded in thirds, covered in flannel. Here’s one that isn’t sewn together yet. It might not need the flannel on the outside, but that helps keep it together and makes stuffing diapers easier. Then we put the two inside the diaper, with the cotton closest to baby’s skin. For our son, the thicker end of the microfiber cloth goes in the front. For our daughter, the extra layers go in the back. I just realized that I have this picture backwards though – the extra layers are in the front like I’d stuff for my son, only it’s a pink diaper. Oops. This is what works for US. Other people may have a system that they prefer. I like this because it’s pretty versatile, it’s relatively effortless, and was VERY cheap to make. I would like to find something trimmer to stuff the diapers with, but for now this works just fine. I’d love to try bamboo and hemp, but haven’t been able to try either one yet. I’ve also considered making some PUL covers to go with the diapers, to make them less prone to leaks. I haven’t gotten that far yet either, lol. Hope this helps explain things a little better! Here are 6 of the newborn diapers I finished yesterday. They seem so tiny compared to the other diapers! They’re from the Mama Bird NB size pattern, but from what I’ve read, the lady that offered the Mama Bird pattern isn’t offering it for free any more. I had quite the adventures making these. The first two (not pictured) I got the steps out of order, so they don’t have the hook and loop closure. It’s not a big deal, since I don’t mind using pins, but I didn’t intend to make them that way. Then, when I did go to put the tabs on the rest, I sewed some of them on the outside of the fleece instead of inside on the flannel where they belong. Oops. Thankfully, Stephen noticed it before I did them all that way – and he even sat down and picked out the stitching for me on one of the diapers before he had to go do something else. I just love brand new diapers. They’re so soft and fuzzy. They hold up well enough in the wash, but I wish they stayed this soft on the outside. Oh well! That gives me a total of 19 newborn-size cloth diapers. They’re stuffed and in the drawer with the rest of the diapers, ready to go! Today I finally finished the cloth diapers that I’ve been working on. There are sixteen here. A friend gave me some fleece she wasn’t using so I can make more (thanks, H!). I’m not sure exactly how many more it will make, but it should bring me pretty close to my goal of two dozen. They are from the Rita’s Rump Pocket pattern (which by now is probably not a surprise to anyone). All the diapers in this picture have a really pale pink flannel for the inside. My favorites by far are the pink ones with the hearts and flowers. They turned out so cute! Although it seems like I’ve been working on them for forever, they really do make up pretty quickly. I’ve been doing them assembly-line style, and that seems to help too. Stephen also asked that I make up some more newborn diapers, so those are next on my list. I printed the patterns today, but didn’t get any farther than that. 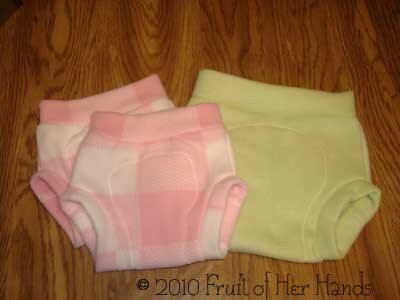 *Cloth diapers – 16 completed, have fleece for more. The flannel inners are already cut out, but not the fleece outers. 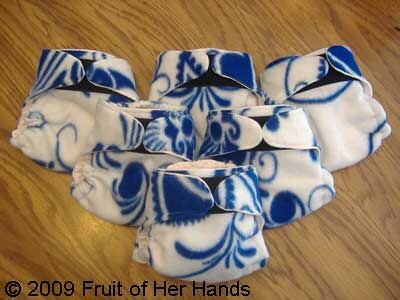 *Cloth diaper covers – have fleece for these (navy) – just need to find my pattern and cut them out. *Bouncy seat cover – thinking of removing this. Stephen is concerned that the boys will torment their sister in the bouncy seat, so I’m waiting to make a new cover. I still might, but we’ll see how things go with the old cover first. It’s funny how some days one thing leads to another, which leads to another, which keeps going on and on and on. . .
Today was like that. I went to put some stuffed diapers away, and ended up sorting through our entire stash of cloth diapers. We have SO many! I’ve been meaning to pull out the newborn diapers, just to have them ready. I remembered that we didn’t have very many, but didn’t remember that we only have 11 of my favorite ones. They’re Mama Bird pocket diapers, and they’re my favorite because they have velcro on them. That led to me sorting through the rest of our fitted diapers and covers, trying to find the rest of the tiny ones. We should have plenty of the Rita’s Rump Pocket diapers once I finish sewing this batch. Those are my all time favorite, but they’re just too bulky on a newborn for my tastes. One thing I did discover is just how many prefolds we really do have. Probably 90% of the prefolds I have were given to me as gifts when Samuel arrived. We have a good 2 dozen Gerber ones. They’re the ones they advertise as diaper service quality – but I’ve never ordered actual DSQ prefolds before so I really don’t know how they compare. Then another dozen or so of some thinner prefolds, and then another two dozen (ish, lol) of really thin prefolds. I have no idea what to do with all of them. Some are so stained I can’t imagine selling them, but the really white ones are so thin I can’t imagine anyone else using them. Then there’s the part of me that says, “Hey – I’ve got at least 8 dozen diapers in the house – don’t get rid of any of them, just in case!” Ha. Yet I rarely use prefolds anymore because I like pockets THAT much better. Maybe one of these days I’ll actually make up my mind. But for now, I need to get finishing the Rita’s Rump Pockets that are in progress. And some more nighttime covers would be good. . .and maybe turn some prefolds into fitteds. . .and maybe, just maybe, 24 hour days will stretch longer, LOL! I never would have thought using cloth diapers would be this addictive, but it kind of has been. I love knowing I have all the diapers I need already at the house. Cute prints and custom diapers (Caleb wears blue, Little Miss will wear pink) are just a plus. . . Recently I switched to using wetbags for storing wet and dirty diapers. It’s been amazing how the zip-top bag keeps the smell down so much better than the lidded pail we used to use. Even with three days’ worth of soiled diapers, you can’t smell them when the bag is closed. That sure couldn’t be said about the pail we had. A lady I know from Hannah’s Prayer was kind enough to send me a yard of polyurethane laminate (PUL) to make a bag with. There was enough for a big one for the boys’ room, as well as a smaller one for the diaper bag, with a little bit left over. I liked the bags so well that I ordered some more PUL to make another large one. I just finished it today. The red of the strap doesn’t match as well as I thought it would, but that’s ok. Now I have two of each size – one to use while the other is in the wash. The PUL was a real challenge to sew because it kept sticking to my presser foot of my machine. I lined the presser foot with masking tape, which worked somewhat. 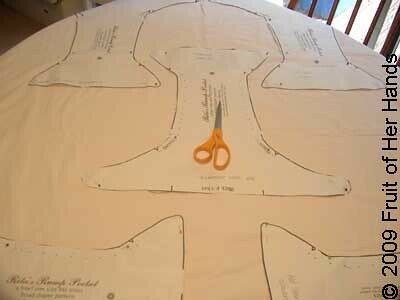 If I were do sew any more PUL though, a walking foot would be a wise investment. At the moment though, I don’t have plans to sew much more of it very soon! Can you tell me what you use to make the diapers. And also, how often do you change your little guy? First, we change him when he is wet. ;O) I don’t really keep track of time. It’s probably every couple of hours or so. I highly doubt it’s much more than about two hours in one diaper. The diapers we use during the day are all from the Rita’s Rump Pocket pattern. I like it because it’s easy to sew and is a good all-around pocket diaper. It’s also a great one-size diaper, but personally I think it’s a bit too bulky if the baby weighs much less than 10 pounds or so. For a baby under 10 pounds, I use the Mama Bird pattern, but made with the same materials and stuffed with the same inserts. To make them, I use fleece on the outside and flannel on the inside. The pattern I linked to shows it made with flannel both inside and outside, but I prefer it with fleece so it doesn’t need a separate cover. Fleece is not waterproof, but it is water resistant. Eventually, if the diaper gets wet enough, it will leak. But I’ve found if you’re changing the baby often enough in the first place, the diaper won’t leak. It’s also more prone to leaking or wicking when it’s compressed like on a long car ride, but we’ve used them with few problems even while traveling. The first batch I made I went out and bought fabric. It was wintertime and flannel was $1 a yard at Walmart, so that’s what I used. A year and a half later, that flannel is getting pretty thin. Granted, these diapers get washed every two days, but it’s still wearing out faster than I’d like. This time I went to the thrift store and found some thick flannel sheets. The quality of the fabric is much higher, and I got a lot more fabric for a lot less money. The fleece I’m using this time is also from the thrift store. $.75 for an entire blanket gets a lot more diapers than $6.99 a yard at the craft store! The flannel sheet I bought wasn’t labeled, but by the measurements, I think it was a queen-sized sheet (it was 88 inches wide). My table is fairly small so I cut the sheet in half, and then doubled each piece so it would be easier to maneuver. By turning a couple of the patterns sideways, I was able to get 20 pieces out of the one sheet. Inside the diapers we use two pieces. One is a microfiber cleaning cloth folded in thirds. I found these in the auto section of Walmart. Right now they’re $5 for a pack of 8 cloths. The microfiber is VERY absorbent, and nice and trim as well. 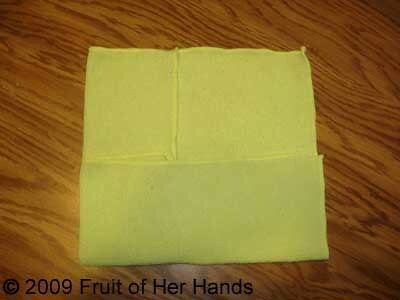 The other piece is a washcloth, folded in thirds, inside a flannel casing (like a pillowcase). That is all sewn together in one piece. When baby is tiny, the washcloth is often enough. Once Caleb got older, he needed the added absorbency of the microfiber layer. I’ve toyed with sewing the microfiber layer to the washcloth insert, but after reading how microfiber can get stinky after a while, decided not to. It comes out sounding a lot more complicated than it really is. I really like the Rita’s Rump Pocket diapers. They really are pretty simple to make and work really well for our family. Microfiber in cloth diapers is wonderful. 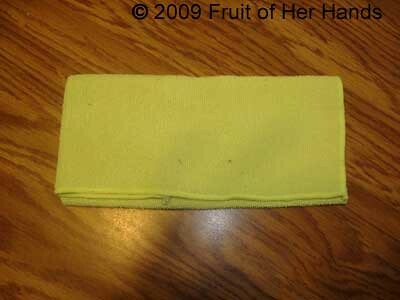 A couple weeks ago, we picked up some microfiber cloths to use as inserts in our cloth diapers. What a difference! It’s trimmer (a HUGE plus!) and seems to hold every bit as much wetness as the cotton inserts did, if not more. Not only that, apparently one thing we needed to do that we weren’t doing is fold the elastic edges in on the diapers. When I made them, too much of the flannel rolled to the outside edge. It caused a lot of wicking and just as much frustration with wet clothes. Now we roll the edges in (the next time I sew cloth diapers, if they’re Rita’s Rump Pockets like these were, I’ll be more careful! ), and between that and the microfiber, our leaks have been cut down drastically. I am so much happier with our diaper system – and it was a relatively easy fix!